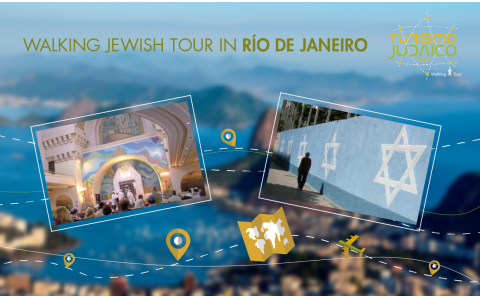 A 3 hour walk to learn and know some of the most emblematic Jewish sites, history and life in Rio de Janeiro, by the hand of a local member of the community. In each station a time travel through, learning about the Jewish presence in the city of Rio de Janeiro during the last five centuries. The historical time and the space of the city converge in an exact point, and it is from there that the trip intends to help discover, experience, reflect and debate contents and experiences with creative methodologies for all the ages. During the journey, the traveler will be able to know the places, streets, buildings, landscapes, macro histories of politics, society and power, and the micro stories of people who were protagonists of the Jewish experience in Rio de Janeiro. ​In this itinerary we want to recreate a story of overcoming, struggle and encounter. During the late nineteenth and early twentieth centuries, Jewish immigrants arriving mainly from Eastern Europe sought new opportunities, among other places, also in Rio de Janeiro. In those decades, thousands of Jewish immigrants settled and built a community, in the same neighborhood where the black population practiced African cults, created the samba and also tried to insert itself in Brazilian society, but from the recent past of slavery. This is a private walking tour, so the time can be adjusted to need of passengers. We suggest from 9 to 12hs. ** English speaking guide, member of the local Jewish Community. Itinerary: "Jews and blacks in the Onze Square"
** We ask, at least, 3 days in advance to book the day of the tour. Groups up to 12 participants. ** It is paid in advance. Important: The photos of the promotional flyer are for reference and the places to visit during the tour are subject to availability and personalized organization of the itinerary, according to the interests of each passenger. The first Jews to arrive in Brazil were during the Inquisition. Portuguese Jews who began to colonize the land and secretly practicing Judaism. In 1636 , the Kahal Zur Israel Synagogue was built in Recife, the capital of Dutch Brazil. (It was reopened in 2001) . During the Dutch regime, the Jews prospered economically, but between 1647 and 1773 the Inquisition, led the Brazilians massively persecuted Jews to emigrate to places like Curacao and New York where they established new communities. In 1773, a royal decree portugues finally abolished discrimination against Jews. They slowly filtered back into Brazil. Almost 50 years later, in 1822, Brazil gained independence from Almost 50 years later, in 1822 , Brazil became independent from Portugal, and a stream of Moroccan Jews began to arrive, and they established a synagogue in Belem (northern Brazil ) called Porta do Ceu (Gate of Heaven ) in 1824 and later a Sephardic in Manaus (in the Amazon ) . At the end of 1800 new Jewish immigrants settled in Brazil, fleeing the Russian pogroms and settled in Brazil to work the land . These settlers then left the colonies and created rich cultural communities in Brazilian cities. By World War I, approximately 7,000 Jews lived in Brazil . Nearly 30,000 Western European Jews arrived in Brazil in the 1920s and , in 1929, there were 27 Jewish schools. Despite a strict immigration policy in the 1930s , more than 17,500 Jews Entered Brazil. While Brazilian immigration enriched Jewish culture, the wide array of Jewish customs and beliefs, made ​​it nearly impossible to unify them. Currently, there are about 96,000 Jews in Brazil playing an active role in politics, sports, academia, business and industry, and overall well integrated into all spheres of Brazilian life are. In major urban centers there are schools, jewish associations and synagogues. Most Jews living in the Brazilian state of S�o Paulo, but there are also important communities in Rio de Janeiro, Rio Grande do Sul, Minas Gerais and Paran�. Brazil is a country in South America, comprising the eastern half of the continent and some groups of small islands in the Atlantic Ocean. With estimated at over 8.5 million km �. The Amazon rainforest covers 3.6 million km � of its territory. Its population is approximately 191.5 million people (as of 2009), Brazil is the only Portuguese-speaking country in the Americas. At the political level, is a federal republic by the union of 26 federal states and the Federal District, divided into 5,564 municipalities. Brasilia is the capital and most populous city Sau Paulo. For the most part, the country is between the terrestrial tropics, so the seasons do not feel in a radical way in much of the same. Thanks to Amazon and its climate, is the country with the most species of animals in the world. The currency is the Real.